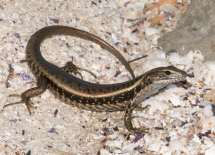 New collaborative research conducted by Macquarie University and the Australian National University on a common Australian lizard, the Eastern Water Skink, has revealed that sexual selection, the process whereby certain individuals gain a reproductive advantage, likely promotes the evolution of ‘floater’ and ‘territorial’ behavioural reproductive tactics in males. The researchers studied six marked populations of the Eastern Water Skink in large naturalistic outdoor enclosures. They followed the movements and behaviour of males during the breeding season, and used genetic paternity testing to determine reproductive fitness. “Ultimately, we were interested in what behavioural traits make a successful male lizard” said lead researcher Daniel Noble. Alternative reproductive tactics (ARTs) have been studied in a wide range of species. However, few studies document ARTs in species where there are no distinguishing features separating males from each other. This study demonstrates that ARTs can be driven by behaviour alone. Noble explains “Males adopting ARTs are often distinct from one another in terms of body size, colouration, or the presence and size of armaments such as horns. We know very little about ARTs in nondescript species. “What makes these results particularly interesting is that we simply quantified behavioural variation to test whether there was evidence of disruptive selection on trait combinations predicted to be associated with ARTs in water skinks. The authors have documented a rare case of ARTs evolving through selection on suites of male behaviours. This cryptic system may be more common than currently understood, and underscores the importance of behaviour as an ART in its own right. The research paper has been published in full online in the American Naturalist.